How To Find Missing WhatsApp Messages On iPhone With iOS 10.3? How to find missing WhatsApp messages on iPhone with iOS 10.3? Most of the users enjoying use WhatsApp to keep in touch with their family, friends or colleague, sending text and media messages to each other. Can be said that WhatsApp is one of the easiest social network apps to use and now adding the new feature “Status” which allow users to post images. Adding new feature that would advance the user experience on using WhatsApp. However, sometimes you may come across data loss due to various reasons such as iOS upgrade, mistaken deletion, etc. You seek for help in order to recover lost WhatsApp messages from iPhone with iOS 10.3 that it could be really time-consuming. Fortunately, I’ve found one WhatsApp data recovery tool that can find missing iPhone WhatsApp messages on iOS 10.3. Read also: How To Backup WhatsApp On iPhone Without iCloud Or iTunes? This professional WhatsApp data recovery tool is referred to iFonebox. With iFonebox, you could get back disappeared iPhone WhatsApp messages on iOS 10.3 either from device directly or extract from iTunes/iCloud backup files. Besides WhatsApp messages, it do supports recover deleted WhatsApp audio messages and WhatsApp attachments. Therefore, if your WhatsApp data unfortunately lost or missing while iOS upgrade, you could get them back under the help from iFonebox. Other than WhatsApp data recovery, iFonebox is also designed for other iOS data recovery such as messages, contacts, notes, call history, Wechat data and so. 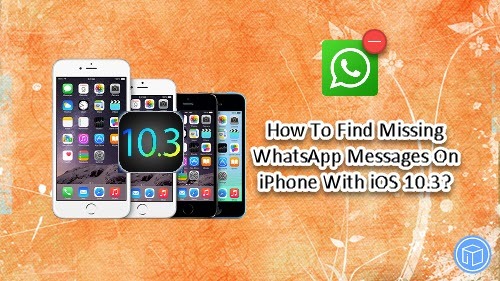 To help you better understanding how to recover lost WhatsApp messages from iPhone with iOS 10.3, we have tutorial for you that explain how to find missing WhatsApp messages from device directly. Before we begin, you’re required to download iFonebox on your PC or Mac. It is fully compatible Windows version and Mac version. In here, we’re taking Windows version as an example, Mac users also applicable for this tutorial too. Run the software. 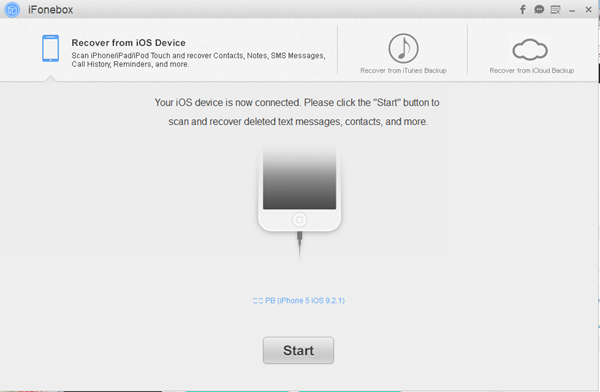 Select “Recover from iOS device” after you launch the software with your phone connected via USB cable. Please wait for a moment while iFonebox detecting your iPhone. And if this is the first time you connect your iPhone to this PC, don’t forget to tap “Trust the computer” on your iPhone screen before we proceed to next step. Next is click “Start” to begin. Scan your iPhone. Select the “WhatsApp” under “Text Data” column and start to scan. PS: the scanning process will take a little bit longer if you having lots of data in your WhatsApp. Just be patient. Preview and recover. 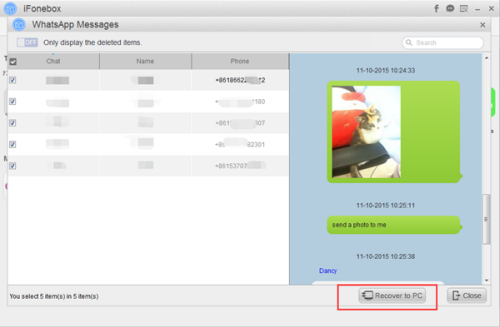 After scanning done, you are able to preview the found WhatsApp messages. At this stage, you can select those WhatsApp messages you want to retrieve and tap on “Recover to PC” button. Then those WhatsApp messages will be successfully recover to your PC. This entry was posted in iOS 10.3, iPhone, whatsapp and tagged iFonebox, iPhone data recovery by IosdroneD. Bookmark the permalink.